Those awaiting results of June 2014 Pharmacist licesure examination may find here the list of passers, top 10 (topnotchers), top performing schools and performance of schools as the Professional Regulation Commission (PRC) and the Board of Pharmacy released results in 2 working days after the exam. PRC on Thursday announced that 1,525 out of 2,779 passed the Pharmacist Licensure Examination. Pharmacy board examination was administered in the cities of Manila, Baguio, Cebu and Davao on June 22 and 23, 2014. The members of the Board of Pharmacy who gave the licensure examination are Ms. Mildred B. Oliveros, Chairman; Mr.Anthony Aldrin C. Santiago and Ms. Adelina C. Royo, Members. 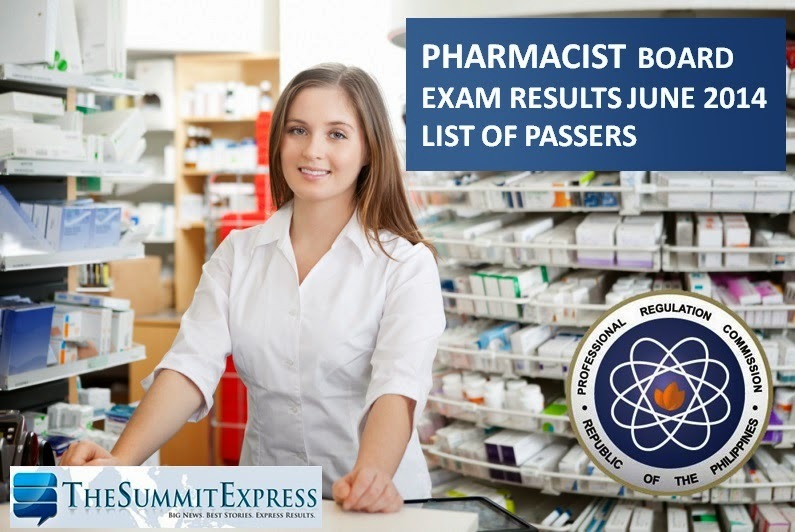 June 2014 Pharmacist board exam covers pharmaceutical chemistry, pharmacognosy, practice of pharmacy subjects on the first day and pharmacology-pharmacokinetics, pharmaceutics, quality assurance and quality control subjects on the last day. In January 2014 exam, results were available online after 3 working days. A total of 937 out of 1,759 hurdled the Pharmacy exams. In June 2013, results released online after four (4) working days. 1,385 out of 2,349 passed the Pharmacy board exam. PRC named Our Lady of Fatima University- Valenzuela as the top performing school in the January 2014 Pharmacist board exam for having 83.33 passing percentage (90 out of 108 passed the exam). Like Us on Facebook or Follow Us on Twitter to receive more updates about Pharmacy licensure exam.